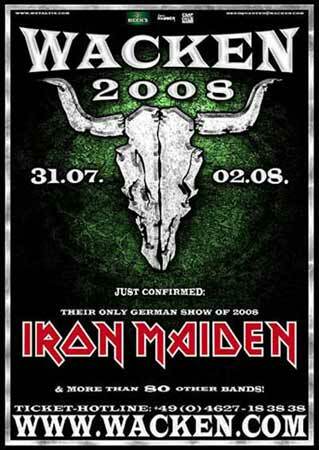 British heavy metal legends IRON MAIDEN will play their only German show of 2008 at next year's Wacken Open Air festival, set to take place July 31 - August 2, 2008 in Wacken, Germany. IRON MAIDEN is expected to perform a set focusing on the "Early Days Part 2" period, featuring classic songs like "Powerslave", "Rhyme of the Ancient Mariner" and "Seventh Son of a Seventh Son". As previously reported, professionally filmed video footage of IRON MAIDEN's entire June 10, 2007 headlining performance at the Download festival at Donington Park, Leicestershire, England has been posted at YouTube. IRON MAIDEN vocalist Bruce Dickinson announced from the Download stage that the group's performance was being filmed for an upcoming DVD. A two-minute video interview with IRON MAIDEN bassist Steve Harris, conducted by NME.COM ahead of the band's appearance at Download, can be viewed at this location.